November is the month of Thanksgiving. As the year is winding to an end, I like to take this month to reflect on all the things I am thankful for. No matter what you believe, if you are thanking God or the universe, or simply fate, take the time to say it out loud or write it down. The act of being thankful, of showing gratitude, has time and time again proven to be the most powerful way to increase your happiness and well-being. I believe wholeheartedly that if everyone practiced a little more gratitude, this world would be a better place. Studies show that grateful people are generally healthier than ungrateful people. They have less physical pain, they have fewer physical symptoms, and they have better sleep quality. We know that it is often not one’s situation, but how one views that situation that leads to happiness and better quality of life. They are stronger people who are more mentally resilient. Little things don’t bother them because they know who they are and are grateful for it. I am so grateful to my parents for modeling this behavior my whole life. My dad has this amazing enthusiasm for life; he finds joy in everything, and my mom always expressed gratitude. I love her stories. She grew up without running water or electricity in a tiny mountain village in Greece. My favorite story is when she moved to San Diego in the 70’s and started waitressing. She would listen to the other women complain about having to do laundry. My mom would start laughing as she told this story. When she grew up, they had to walk over a mile to the well carrying heavy jugs of water, heat the water over a fire you had to make yourself, and scrub the laundry until your hands nearly bled. (I’ve been to her village. She wasn’t exaggerating). And let’s not forget how hard it was to even make soap. Then you had to hang everything outside to dry. Yes, even in winter. Yet she never complained about this, because she was grateful to have access to water and be able to have clean laundry. So when she heard everyone here grumbling about doing their laundry, she would get the biggest smile on her face and say, “Are you kidding me?!? I LOVE doing laundry. You put the laundry in the machine and push the button. Laundry done!” She would say it like she was Cinderella’s fairy godmother… with a heavy Greek accent. We know that happiness starts with a shift in perspective. Do you look at a field of dandelions and see wishes or weeds? Does the laundry pile depress you, or make you happy that you have clothes and little ones who play so hard they mess them up. Is the glass half empty of half full? Heck, I’m stoked I have a glass!! Yes, I may be your eternal optimist, but you have to start somewhere. Starting with one thing every day (write it down if you’re the journaling type) that you are grateful for will make a difference. Little by little, a little becomes a lot. I’m going to challenge all of you this month to write one letter a week – a handwritten letter sent in the actual mail with a real stamp – to someone you are grateful for. This is only four letters. You can do it. I believe in you. Take the time to write down why you are grateful for that person. Then mail it. I dare you. It might be scary and out of your comfort zone, but I promise you, you’ll make their day. I try to do it for my friends’ on their birthdays, but it shouldn’t take a birthday for someone to feel the love. There are so many people out there to whom I’m grateful, that I could write one letter a week all year long, and still not even come close to covering them all. Old teachers, coaches, family members, friends, my kids’ friends (yes I am grateful to them too! ), all of you … the list is so long. We find what we are looking for. If you are constantly focusing on the things that bring you joy, happiness, strength, peace – those are things you will bring into your life. In fact, practicing gratitude may have lasting effects on your brain. 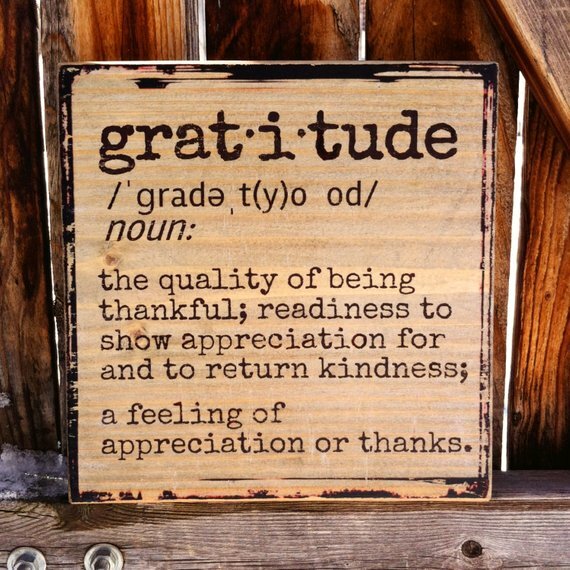 A study at UC Berkeley analyzed three groups in a gratitude study. While most studies on gratitude have been done on generally happy people, this study was conducted with participants who were seeking help with depression and anxiety. All three groups received counseling. One group was tasked with writing a weekly letter in gratitude to someone (yes, I totally stole their idea). The second group was tasked with writing a letter expressing all of their negative thoughts and emotions. The last group only received counseling and did not write. Of all three groups, the group who wrote positive letters in gratitude saw the highest benefits. Moreover, the more positive words the writers used, the more benefit seen. Not only that, but months later these effects proved to still be working. Most interestingly, when they compared those who wrote the gratitude letters with those who didn’t, the gratitude letter writers showed greater activation in the medial prefrontal cortex when they experienced gratitude in the fMRI scanner. This is striking as this effect was found three months after the letter writing began. This indicates that simply expressing gratitude may have lasting effects on the brain. “When you are grateful, your heart is open—open towards others, open for surprise,” says David Steindl-Rast, a Benedictine monk who spent his teen years under the Nazi occupation. “Because gratitude expresses courage, it spreads calm.” It takes courage to admit that you depend on other people, which is one of the things that can happen when we thank someone. Gratitude is an alternative to fear of other people. It can help us to feel less alone with the problems we face. We are so thankful for each of you. I am thankful that you are taking the time to read this. I am thankful that you are a part of our little community over here at Cap Wellness and Cap Wellness Center. This practice has allowed my husband to do what he loves, to help people, to pour his heart into caring for his patients, and to do it on his own terms without corporate bureaucracy breathing down his neck telling him what they think is important. Here is a little secret, it’s not the bottom line. Each of you, and your beautiful families are what matter. Making this world a better place is what matters. This practice has allowed me to step down from a career that would have been really hard to walk away from. It’s let me be a better mom and a better person. Thank you for supporting us and trusting us with your care. We are so grateful to each of you. It is a privilege.